Forever Found, Forever Lost – a modern werewolves’ story. A book could be one of the best gifts for most occasions. If you didn’t feel the truth in such a statement, maybe you haven’t had the right book as a present J. I for one felt it again when a few months ago I received my copy as a gift from the author himself (can you believe he sent it thousands of miles away from USA – up to Europe, Bulgaria :)! And I’m really glad for his confidence and trust in my reading skills, thank you, my friend, Ross Osborn! Actually, I usually don’t like stories with too common characters in the genre like vampires, werewolves, fairies, etc (they are as ordinary already as the people we see every day in the streets), and try to create some new in some of my books (have a look at my blog post New vs. old characters in fantasy/sci-fi genre). 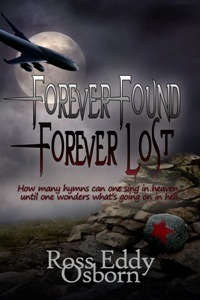 Yet, as every rule and fact have their exceptions, Forever Found, Forever Lost is a excellent prove a story with common characters could be as interesting as any other with any creatures and monsters involved. To combine the old fairy-tale and fantasy beings with new details and adventures is a great way to create a breath-taking story and Ross Osborn did a good job with this werewolves’ novel of his. Here, every fan of fantasy, horror and thriller genres could find guiding lines about the way to really kill a werewolf, what a life such creatures should actually lead to avoid killing of innocent people, the interesting and thrilling feelings and senses the hairy and vicious beings have, etc. I guess some people wouldn’t agree with me, but I couldn’t refrain from pointing out this book also includes not only horror, breath-taking adventures, facts and events. There are philosophy and wisdom too, there’s what the enormous power of one of the greatest forces in the Universe (LOVE with capital letters) could do, there are interesting details about life in the cold areas of Alaska and the customs of the natives, etc. Finally, I have to admit I really enjoyed all the slang and Scottish dialect’s expressions in the book. As I am not a native speaking English guy, they looked as interesting and informative to me as the other facts and descriptions in the story J. Thank you again, my friend, Ross Osborn! Will be glad to read your next books too, with all the gripping and informative adventures and events!